Raven Collage. 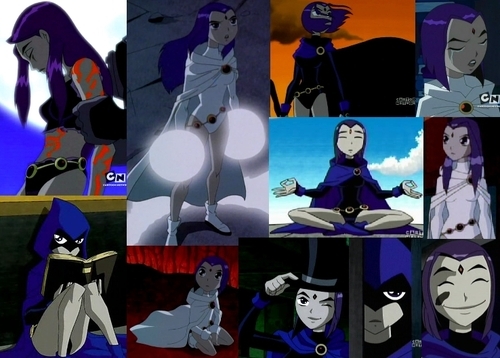 A collage of Raven in all her awesome demonic glory.. HD Wallpaper and background images in the Teen Titans club tagged: teen titans raven collage. wonderful? stupendous? how about alrightous! lol. omg that iz sooooo kewlz 5 stars!!!! what episode is the top left pic in again??? was it even an episode? I think that episode is Birthmark. I love Raven she my fav character + her best look is the left picture above ,nice college though. Is anyone a RobinxRaven fan? Is anyone a RobinxRaven fan?" What episide is raven Happy :) ???????????? Since when Raven have long hair? Also, in an episode, Raven said she got some magician tricks on her own. When Mumbo asks her how to do it, she says: "A magician never reveals her secret."